Satellite observations have a huge impact on numerical weather prediction (NWP) model analyses and forecasts, with sounding data from polar orbiting and GPS-radio occultation satellites reducing model forecast error by almost half. All of this despite the fact that NWP models only assimilate 5% of all satellite observations! This lesson discusses the use of satellite observations in NWP and how model limitations prevent more of the data from being assimilated. The lesson begins by briefly describing the history of satellite observations in NWP and their impact on NWP model forecast skill. 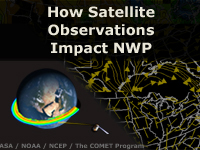 The next part provides background information about the types of environmental satellites that provide input to NWP, the satellite observations that are assimilated, the major components of NWP models, and how they forecast atmospheric behavior. This sets the stage for the main part of the lesson, which examines how observations from new satellite instruments are vetted for inclusion in data assimilation systems and how observations deemed acceptable are actually assimilated. The final part describes current challenges to making optimal use of satellite observations in NWP and advances that are expected to address these challenges and improve model forecasts. Easy to understand, lots of up to date information. good module! This is a very good module with up-to-date information about current satellite assimilation and prospects for the next few years.